WASHINGTON, DC - DECEMBER 28: Senator Carl Levin (D-MI) (R) and Senator John McCain (R-AZ) hold a news conference about filibuster reform on Capitol Hill December 28, 2012 in Washington, DC. We now have a comprehensive look at the filibuster reform package accepted by Mitch McConnell and Harry Reid. It’ll be schlepped to Democrats at an early afternoon meeting. And yes, it functionally ends the campaign for the “talking filibuster,” and for putting the burden of filibusters on the minority to get 41 no votes, instead of on the majority to get 60 ayes. “It looks a lot like McCain-Levin,” says a Democratic aide. And it does. 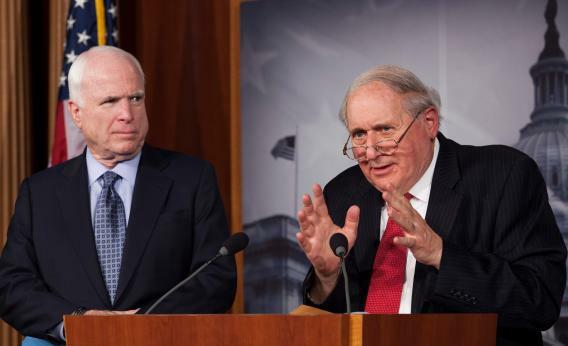 Late last year, as the Merkley-Udall campaign gathered steam, John McCain teamed up with Carl Levin, one of the Democrats’ Senate statesman, who was reluctant to support a 51-vote “nuclear option” and get 100 percent of what reformers wanted. Here’s what made it from that deal to the Reid-McConnell deal. - Making it easier to go to conference after the Senate and House have passed a bill – allowing only one filibuster, not three. - Limiting debate time on district court nominees from 30 hours to 2 hours. The next bit is complicated, so I’ll just quote Stein/Grim. But the onus of the filibuster remains with the majority. Senators will remain able to place holds, and the holds will have to be broken with 60 votes – for this Congress, those will be bipartisan votes.